In 2014, C.J. Mahan Construction Company out of Columbus, Ohio, was contracted by the Corps to do several projects at Olmsted Locks and Dam. 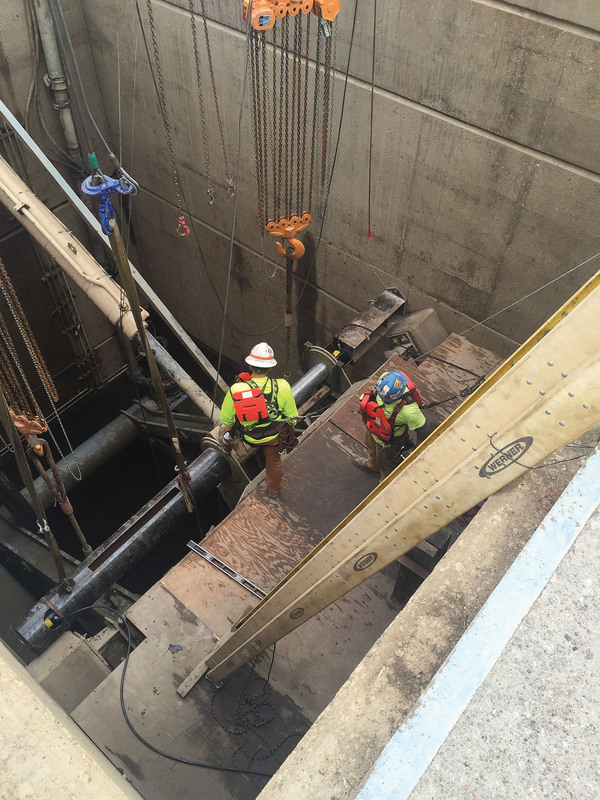 The project consisted of replacing hydraulic cylinders on eight miter gates and culvert valves in the lock chambers, and the installation of an automated control system for locking operations, in addition to other projects that were wrapped up in 2016. Additionally, the company had to dewater both lock chambers, clean the miter gates and culvert valves, extend two maintenance bulkhead reinforced-concrete sills, replace the air bubbler and grease lines in the lock chambers, and more. During this time, C.J. Mahan also replaced 16 latching hydraulic cylinders and four spares. The project amounted to a major rehabilitation of the locks, which were completed in 2004 but had never been in service because the dam wasn’t completed. The company said that it originally envisioned its work at Olmsted to take two seasons, in which time it would maintain one lock chamber to keep available at all times. Instead, the company proposed, and the Corps agreed to an acceleration of the contract whereby work in both chambers would be completed in 2015. The balance of work completed in 2016 consisted of removing and replacing hydraulic cylinders that were delayed due to a material design change initiated by the Corps, according to C.J. Mahan. This work, however, was completed in 2016 without dewatering the lock chambers and with minimal disruptions to lock operations. Founded in 1977, C.J. Mahan Construction Company is a regional heavy-civil and marine contractor. It also operates a harbor facility on the Ohio River outside of Cincinnati. The company designs, constructs and repairs a wide range of structures, including locks, dams, mooring cells, heavy-capacity foundations, cofferdams, industrial docks, water-treatment facilities, power plants and bridges. C.J. Mahan routinely self-performs concrete placement, pile driving, large-diameter drilled shafts, dredging and excavation for both public and private owners. It has performed work for multiple districts in Corps of Engineers, the Tennessee Valley Authority, various state Departments of Transportation, city municipalities, Marathon Petroleum, American Municipal Power, and General Electric.